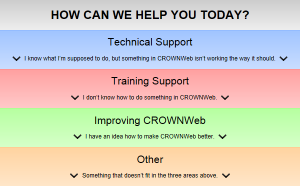 The CROWNWeb 5.0 New User Training session offers a broad summary in to the new look of CROWNWeb 5.0. Participants in this ONE-HOUR event will be briefed on the basics of using CROWNWeb 5.0 to manually enter and submit data to CMS. Content is presented in an easy-to- follow format by certified trainers with ample opportunity for questions and feedback.